Written by Sean Zdenek on December 18th, 2015 May 11th, 2016 . The default caption setting on Hulu includes a thin black stroke outline and a transparent background that, unfortunately, do not provide enough contrast for the captions when the video image behind the captions includes similar shades of yellow or white. The good news is that Hulu’s caption settings are user customizable. Source: Hulu.com. Options for customizing the display of closed captions are shown. The default setting is yellow type, Arial typeface, medium size, thin black stroke, no background color (transparent). 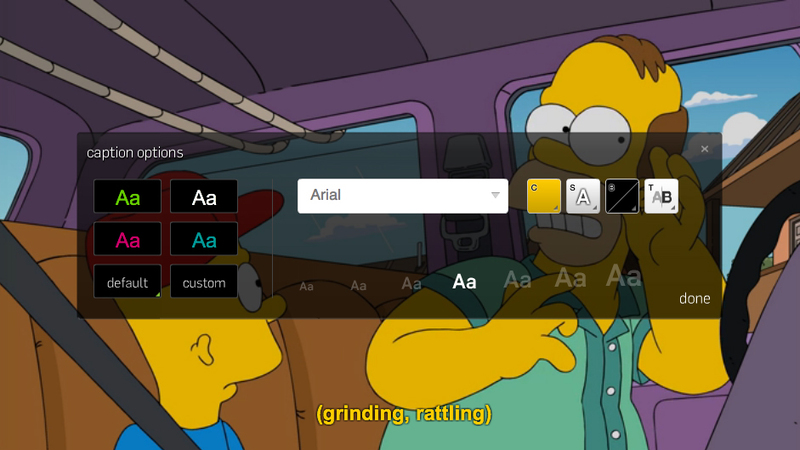 Hulu’s default caption color is very similar to the skin tone of the animated characters on The Simpsons, a fact I noticed a couple nights ago while watching the latest episode of The Simpsons on Hulu (“Barthood,” season 27, episode 9). 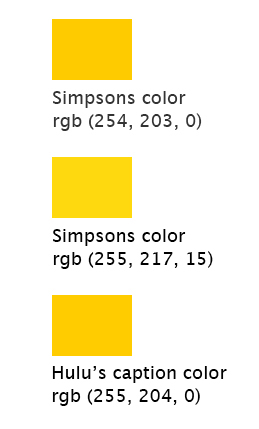 Simpsons yellow has been defined as either Pantone 116 C or a slightly brighter yellow alternative (Red 255, Green 217, Blue 15). 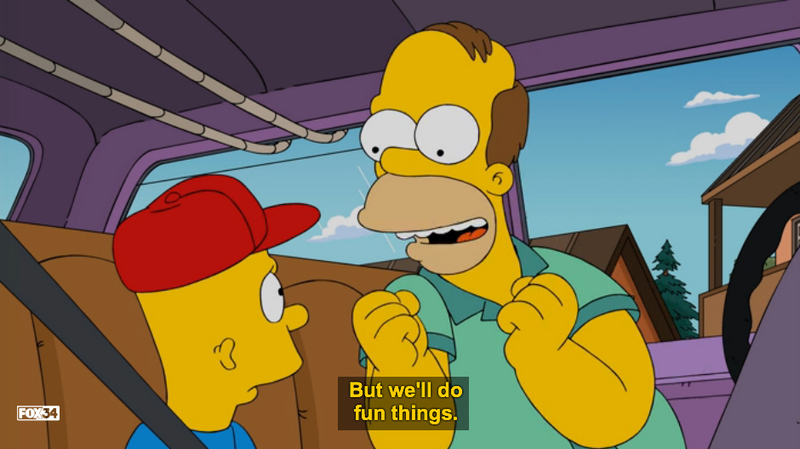 For example, see the fan pages for The Springfield Files, Back of the Cereal Box, Colour Lovers, The Simpsons Archive, HubPages, and The Simpsons FAQ. Three shades of yellow-gold are displayed side-by-side for comparison. The first two shades have been suggested by fans as the skin tone of the characters in The Simpsons’ universe: rgb (254, 203, 0) or rgb (255, 217, 15). The third shade corresponds to the default caption color on Hulu.com: rgb (255, 204, 0). The shades are different but just barely. 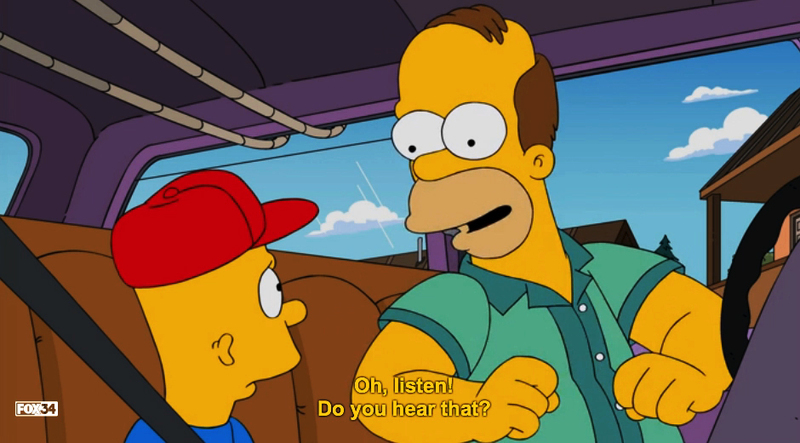 In this clip from “Barthood,” note how the purple car dashboard provides sufficient contrast for the yellow captions until the scene shifts to Homer’s yellow arm in the background. Source: The Simpsons, “Barthood,” 2015. Hulu. 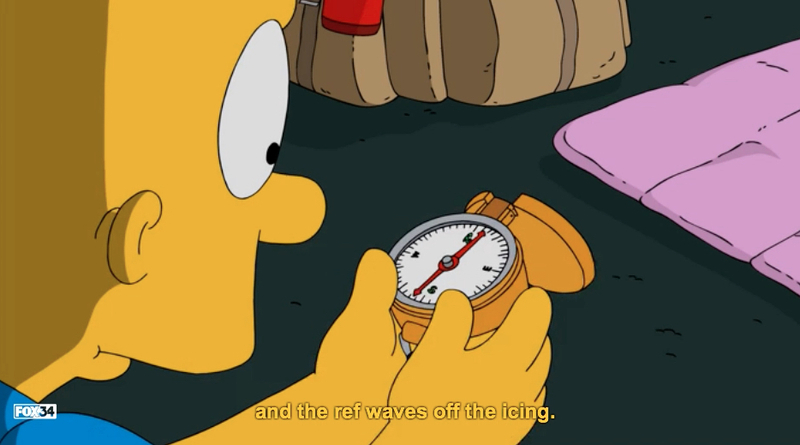 An example of how the default yellow captions on Hulu.com interact and blend with the same yellow color of the characters on The Simpsons. Source: The Simpsons, “Barthood,” 2015. Hulu. Bart’s arm yellow arm provides poor contrast for the default yellow Hulu captions. This problem is exacerbated when Hulu is streamed from a wall-mounted TV and the viewer is positioned a number of feet away. This contrast problem is easy to fix with a quick customization of the captions. The foreground color can be changed to green or red, but a more effective solution would be to add a semi-transparent or opaque background, which provides sufficient contrast regardless of the colors in the video. Source: The Simpsons, “Barthood,” 2015. Hulu. The default yellow captions have been customized in this frame with a semi-transparent black background. This simple example suggests a continuing need to define effective caption color in context and to give users full control over a range of color options. While yellow captions have the advantage of standing out, that advantage is compromised on a show like The Simpsons that relies so heavily on virtually the same color. Now that I’ve recently started watching Hulu and Netflix programming on a flat screen television mounted to the wall, I’m reminded of how the need for strong color contrast increases as the viewer’s distance from the screen increases. Reading Sounds is published in hardcover, paperback, and e-book by The University of Chicago Press (2015). This supplemental website includes all of the media clips discussed in the book. Dr. Sean Zdenek is associate professor of technical and professional writing at the University of Delaware. He has been keenly interested in closed captioning for over a decade and writing about it since 2009. Send him an email (zdenek@udel.edu) or follow him on Twitter (seanzdenek).